Top paying AdSense niches are as a result of various factors. It is important that you know the bolts and nuts to the niche you belong to. So while compiling the list of “highest paying AdSense niches” here are some of the driving factors noted. The highest paying niche in the world has an undoubted fierce competition fueled with lots of factors. This is somehow true based on the AdSense list of highest paying keywords. The competition is fueled by the fact that many companies advertise in such niches compared to the limited high yield space for advertising. Also a rapidly growing or predicted growth in a certain industry normally fuels such competition. It is common knowledge most companies will fight for a share of the growth otherwise they face losing on the market. There are two conversion sense that influence high payment in certain business niches. Number one is the reward for conversion and secondly low rates of conversion. ‘Conversion Reward‘ here may mean maybe a sale, sign up, or any other target for advertisers. For example, a top insurance company may pay $200 for every successful customer that buys a certain type of insurance cover plan. So apart from earning only from clicks, impressions … and what have you, if one of the Google AdSense Ads just happened to make this conversion, you could as well walk away with more than $200 from just a click; other factors too considered. It is not easy to make such conversions everyday. The advertisers know this fact and will pay you ‘handsomely’ for it. This is why a low conversion rate in a highly competitive sphere may just create high paying AdSense niches. Most customers in the top paying niches tend to remain largely loyal for long. For example, a customer that buys a web hosting package will most likely subscribe for a longer term. That is; a year, two or three with an option of renewing this package before expiry of the term. There is always a 30-60 days moneyback guarantee. This gives a customer the option to cancel the order and get a refund within the specified moneyback guarantee period if he/she is not impressed by the services offered. This makes the conversion here tricky as a valid conversion may take between 30-60 days but only if a customer does not cancel the order hence high compensation. But remember after the 30-60 days guarantee offer elapses, a customer is not entitled to a refund. So once the door shuts, there is no going back. So advertisers only need to win and impress a customer and they will certainly get back the Return On Investment from your loyalty. This sounds easy but there is more to it than a click and sale. Traffic from search engines convert most since the person performing a ‘search’ is already in need of something. And if he/she finds it will buy/subscribe to it. Unfortunately, they are less likely to search past the third page. So they will perform another search with a different keyword or buy what they find. So if 100 companies are competing to list Ads on the first page of Search Engine’s Results Page, you guess what will happen. I know the means will justify the end here. Top paying AdSense niches, will be created. Some companies just want the world identify them as the best in terms of the provision of certain services in a particular industry. They want to sell their image as a … company. Others just want to market a product to create awareness or increase sales. Whichever the case, I bet you they will knock out other advertisers to list Ads in positions and areas that will help hit the target easily. 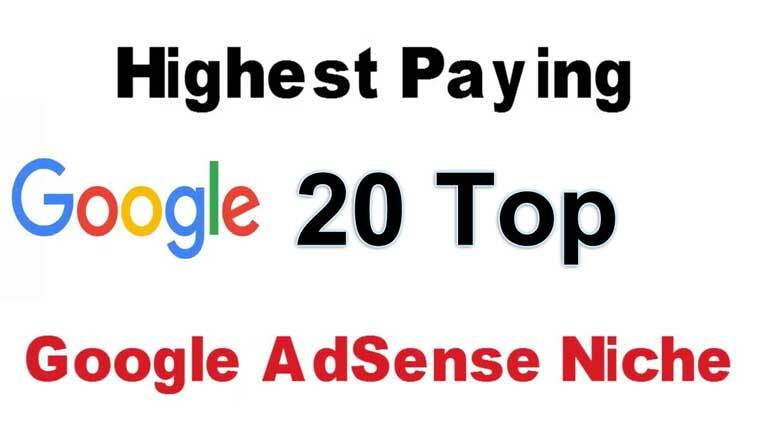 Here is a random list of the 20 top paying AdSense niches no merit followed. Not to say that this list is static, it will always change based on different dynamics.